While Sebastian Vettel took his third consecutive in a thrilling race at Interlagos, fans around the world continue to debate who would have been the most worthy victor. The reaction in the British papers to Vettel's achievement is largely positive, but the "genius" of Adrian Newey and the "dignity" of Fernando Alonso were prominent in Monday's coverage of the championship finale. 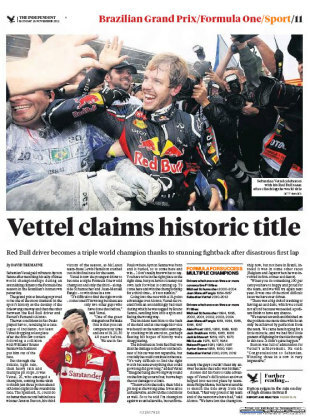 "Sebastian Vettel became the youngest triple champion in history thanks to a touch of genius in a dramatic finale," wrote Byron Young in the Daily Mirror, referring to Newey's decision to change an engine map having studied a photograph of Vettel's damaged car. Of Vettel he said: "At a stroke he outdid a pantheon of the greatest names ever to sit in a racing cockpit ... with his car battered, sidepods ripped open, a broken radio, a bungled pit stop that frittered 20 seconds and a bad tyre choice, Vettel overcame the odds." The Times described Vettel's achievements so far as "extraordinary", saying: "Jenson Button won the day, but Vettel won the gruelling 20-race season. He was declared world champion for the third consecutive time, breaking yet another record in his extraordinary career. He is, at 25, the youngest driver to have taken the crown three times." However, it was not all positive coverage for Vettel, as Tom Cary noted the difference in the two championship contenders' grace after the race. "As Red Bull celebrated wildly and Ferrari dissolved in to tears, Alonso was dignity personified," he wrote in the Daily Telegraph. "[Vettel's] recovery to finish sixth behind McLaren's Jenson Button ensured that the 25 year-old joined two of the greats of the sport in Juan Manuel Fangio and Michael Schumacher in winning three consecutive titles. All the rest is hot air. "Some of the hottest came from Vettel himself. Overcome emotionally and physically after his victory and, with a thousand microphones stuck in his face, the newly crowned triple world champion suggested that Red Bull's rivals had resorted to "dirty tricks" in an effort to derail his title march. "A sour note to end on, but a fittingly dramatic conclusion to an extraordinary championship."